Luxurious is the word to best describe this golf community. Barefoot Golf Resort is quiet & peaceful while only being a short drive from area attractions, restaurants, theater performances and the ocean. 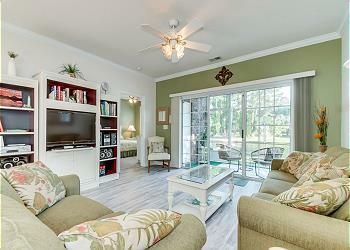 The River Crossing community, inside The World Famous Barefoot Golf Resort, is located at 5825 Catalina Drive in North Myrtle Beach. Prepare to be "wowed” as you enter this well maintained golf resort with beautiful landscaping and several walking trails. Experience the ultimate in resort style living without the crowds often found at a large resort. River Crossing has an outdoor pool with lounge chairs & bathrooms as well as a BBQ area. During peak summer months take the complimentary shuttle to the oceanfront. Beach chairs and umbrellas can be rented from the lifeguards stationed on the beach right in front of the Barefoot Resort Cabana. Barefoot Resort has four pro-designed, world-class golf courses, the Norman course, the Davis Love course, the Dye course, and the Fazio course. Golfers are welcomed by an elegant clubhouse.